Are weeds taking over your lawn? Do you see some bald spots in your lawn? Are bugs and caterpillars eating your yard? Does your yard look yellow? If your answer to most of these crucial questions is yes, you should get lawn care services in Poulsbo WA as soon as possible! Trust Your Yard to Experienced and Talented Landscapers! But, we know that the plan to action is not as simple as to call any landscaper and trust them with your lawn care. That’s right. You must be careful to whom you are going to trust with the care of your lawn. Since your lawn is the living part of your outdoors, it is delicate. Your yard always needs someone with the skills, knowledge, and love to take care of it. Otherwise, if you hire an inexperienced or the wrong gardener to lay a hand over your lawn, it will for sure have a detrimental effect on your yard health, growth, and beauty. So, you better protect your property and get professional lawn care services in Poulsbo WA. Here at Alex’s Landscaping and Excavating, we have the love, experience, and responsibility to recover your yard no matter how terrible or mistreated it was. Over the last 15 years, we have helped many clients with lawn mowing, weed control, yard pest control, lawn fertilization, overseeding, lawn aeration, mulching, and much more. Make Your Yard Look Great Again! Lawn care is not only about mowing. It takes more than that. It can require looking after the lawn design and layout, and just everything that your garden needs to stay healthy and look beautiful. When hiring Alex’s Landscaping and Excavating, you’ll get the utmost attention, and your yard will be our priority. Cutting the Lawn at the Ideal Height and Timing! Of course, there is a procedure and variables to consider when mowing your lawn. You cannot just go and mow the lawn at any height and time it pleases you. Well, what happens is that improper lawn mowing (wrong time and height) can stress the grass, attract yard pests, and illnesses. So at What Times in the Day We Advise to Mow the Lawn? There are mainly two best times to mow the lawn. When getting lawn care services in Poulsbo WA from us, we’ll make appointments at the best times of the day, so that your garden doesn’t undergo stress. So, the best time to mow the lawn is mid-morning. Between 8:00 am and 10:00 am the heat of the day has not settled. So, we mow the lawn before the day gets hot since a cooler temperature will cause less stress to your grass, making its recovery a complete success. When mowing the lawn in plain sunlight, it will feel stressed and cause some leaves to dry, and nobody wants that. Late afternoon has also the ideal temperature for mowing the lawn. By cutting the grass at this time, it will have few hours to recover before the nightfall. We Cut the Grass at the Right Height! One detail that is sometimes overlooked when performing lawn care services is the ideal mowing height. Some inexperienced gardeners cut the grass too short. And this, without doubts, will cause many problems to your lawn. When cutting your lawn too short, the soil will lose moisture at a more rapid pace. Besides, when mowing the grass too short, its root system won’t grow deep, making your yard susceptible to droughts. There is even more! A very short grass fosters an environment for weed and disease infestation. But when hiring us, you won’t have to worry. Here at Alex’s Landscaping and Excavating, we pay attention to every detail. Thus when getting our lawn care services in Poulsbo WA, you’ll get your grass cut to the ideal height. In fact, the proper height for mowing your lawn depends mainly on the type of grass. For instance, Bentgrass can be mowed 0.25 inches, while tall fescues should be mowed 3-4 inches high. It’s important to mow your grass at the proper height because it makes it drought-tolerant and it discourages unwanted weed to grow. Get Our Support at All Times! Call us at (360) 301-7924 to get prompt and reliable lawn care services in Poulsbo WA. You’ll have all the support and knowledge of our skilled lawn care technicians. You can count on us for keeping your yard healthy and growing thicker. Our services include but are not limited to weed control, yard pest control, lawn fertilization, overseeding, lawn aeration, and mulching. Remember that the yard of your dream is one call away with us! Our vision at Alex's Landscaping & Excavating is to become the most-sought after landscaping service providers in the entire area by offering responsible garden maintenance and friendly services at competitive prices. Our mission at Alex's Landscaping & Excavating is to provide high quality landscape design and care through unparalleled quality, responsible service, and timely solutions at great prices. Choosing Alex's Landscaping & Excavating is the equivalent of choosing exceptional landscaping design, care, and maintenance at prices that fit your budget. The right sprinkler system can help you conserve water while still committing to the provision of sufficient water supply for one’s yard. Install top of the line sprinkler systems that help you water the garden and whole yard. There won’t be the need for you to manually water the lawn anymore! Have you ever dreamt of the ideal patio? Stop dreaming about it and let’s make it a reality. Our team is qualified and equipped to help you bring the perfect patio to life. Whether you envision a patio for leisure or entertainment, we have you covered. Contact our team today. A dirty roof is unappealing. Not to mention the weight of debris can take a toll on the roofing’s conditions. 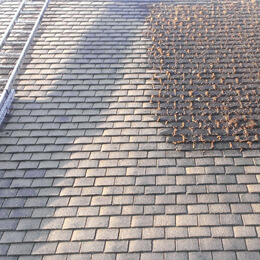 Luckily, you can count on our more than qualified team to assist you with roof cleaning. Regardless of how big or small the roof is, we have you covered. Contact our team now!